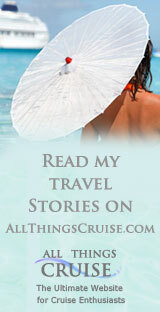 Day Nine: MS RotterdamArrecefe, Lanzarote, Canary Islands. I was last here twenty four years ago when the QE11 stopped here. This is where, at that time, we had lunch in a little café by the ocean that served icy beer and spicy potatoes that were unique to the Canaries. They are little potatoes boiled in their skins in a thick salt and water solution so that the potatoes have a crust of salt on the outside. They served a delicious red picante sauce, quite hot, and mayonnaise to dip the potatoes into. When I got home, I created an equivalent recipe that I called Lanzarote potatoes and everyone has loved them for years. So of course one of the orders of business was to try the special potatoes again. We found the Café Central, which claimed to serve the best tapas in town. We had a good strong espresso then tried the potatoes. 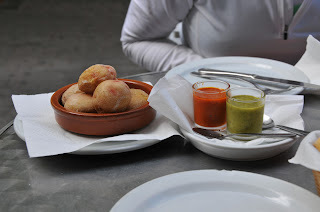 These ones were a bit different , served with both a red and a green sauce. The red sauce was the hot one, as I remembered it, except that this one had tons of garlic in it. The green sauce was a cilantro sauce, not as spicy. So now I will have to tweak my recipe when I get home. We walked along the pretty breakfront boulevard, and found a food fair in progress, despite the fact that today is Sunday. There was a man offering tastes of sausages and grilled ribs, with a loud Spanish patter that was lovely to listen to. It was also nice to see the men, generally older, sitting in the cafes beside the ocean, drinking sherry fino and playing cards. They looked so relaxed. That evening, as we left Lanzarote behind, we enjoyed the Sommelier’s dinner in the Pinnacle dining room. The food was lovely - I will post a separate sidebar with the menu and pairings for those of you who are into such things (as I am) - but the wine pairings were disappointing, by and large.